During the Leonid meteor storm, an estimated 100,000 meteors per hour were seen. Alberto Santos-Dumont of Brazil proved an airship is maneuverable by circling the Eiffel Tower in Paris three times. J. H. Metcalf discovered asteroid #622 Esther. French cyclist Paul Cornu flew the first helicopter, a twin rotor design. In papers read before the British Interplanetary Society, H. E. Ross described a manned satellite station in Earth orbit and a manned Lunar landing mission. In a paper presented to the British Interplanetary Society, H. E. Ross described a manned satellite station in Earth orbit that would serve as an astronomical and zero-gravity and vacuum research laboratory. Ross' proposed design was a circular structure that housed the crew of the space laboratory (24 specialists and support personnel) and telescopes and research equipment. The station, he suggested, could be resupplied with oxygen and other life-support essentials by supply ships launched every three months. A paper Ross read described a manned Lunar landing mission which would require a combination of the Earth orbit and Lunar orbit rendezvous techniques. Three spacecraft would be launched simultaneously into Earth orbit, each carrying a pilot. After rendezvous, the crew would transfer to ship A, which would refuel from ships B and C. Ship C would be discarded completely, but ship B would be fueled with the surplus not needed by A. Spacecraft A would then be fired into a translunar trajectory. Upon reaching the Moon, the spacecraft would go into Lunar orbit, detach fuel tanks, and descend to the Lunar surface. For its return to Earth, the spacecraft would rendezvous with the fuel tanks, refuel, and fire into a transearth trajectory. Approaching Earth, the spacecraft would rendezvous with ship B, the crew would transfer to ship B, then descend to Earth. 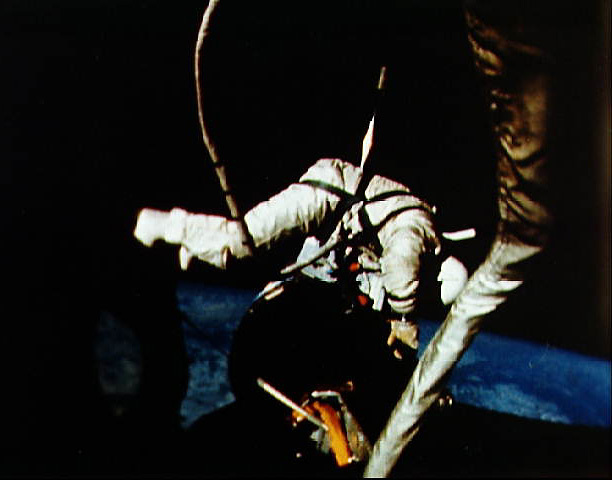 The ability to rendezvous in space was seen to be the essential element of such a project. The total payload weight at launch would be 1,326 tons equally divided among the three ships, as compared to 2.6 times this weight required for a direct ascent and return from the Moon. During the 2h 6m Gemini 12-2 EVA, astronaut Buzz Aldrin photographed star fields, retrieved a micrometeorite collector and did other chores, at last demonstrating the feasibility of extravehicular activity. NASA launched HEAO 2 (High Energy Astronomical Observatory), which was renamed Einstein after launch. NASA's HEAO 2 (High Energy Astronomical Observatory, renamed Einstein after its launch on 13 November 1978) was the world's first orbiting imaging X-ray telescope and returned detailed quasar images and discovered that Jupiter and Earth emit X-rays. The satellite also made over 5,000 targeted observations and discovered several thousand "serendipitous" sources that fell within the field of view of its imaging instruments. The spacecraft re-entered the Earth's atmosphere on 25 March 1982. Communications with the Viking 1 Lander on Mars ended, the last operating Viking craft. A Scout G launched from Vandenberg, California, carried the Polar BEAR (Polar BEacon And Research) satellite into orbit to study the Earth's magnetosphere. USSR launched the Cosmos 1791 Tsikada military navigation satellite from Plesetsk, which replaced Cosmos 1553, and was positioned in plane 11 of the constellation. An Ariane 44L launched from Kourou carried the Arab States' Arabsat 2B and Malaysia's Measat 2 communications satellites into space, which were initially positioned in geosynchronous orbit at 21.9 deg E and 148 deg E, respectively. An Ariane 44LP launched from Kourou carried the GE 4 satellite into space, which provided C and Ku-band communications services for GE Americom, replacing Spacenet 4, and was positioned in geosynchronous orbit at 74 deg W.
ESA's SMART-1 probe entered its initial Lunar orbit. ESA's SMART-1 (Small Missions for Advanced Research in Technology 1), launched 27 September 2003, was a Lunar orbiter designed to test spacecraft technologies for future missions. It entered an initial Lunar orbit on 13 November 2004. The primary technology tested was a solar-powered ion drive. It also carried an experimental deep-space telecommunications system and an instrument payload to monitor the ion drive and study the Moon. The primary scientific objectives of the mission were to return data on the geology, morphology, topography, mineralogy, geochemistry, and exospheric environment of the Moon, in order to answer questions about planetary formation accretional processes, origin of the Earth-Moon system, the Lunar near/far side dichotomy, long-term volcanic and tectonic activity, thermal and dynamical processes involved in Lunar evolution, and water ice and external processes on the surface. The primary objective of SMART-1 was to test the solar-powered ion thruster (Solar Electric Primary Propulsion, SEPP). It also tested miniaturized scientific instruments for use on future ESA missions. A secondary objective was to learn more information about the Moon, such as how it was created. SMART-1 was to map the Lunar surface using X-ray and infrared imaging, taking images from several different angles so the Moon's surface could be mapped in three dimensions. It was also to determine the Moon's chemical composition using X-ray spectroscopy. A specific goal was to use infrared light to search for frozen water at the Moon's south pole, where some areas of the surface are never exposed to direct sunlight, and to map the Moon's Peak of Eternal Light (PEL), an eerie mountaintop permanently bathed in sunlight and surrounded by craters shaded in eternal darkness. SMART-1 was a box-shaped spacecraft roughly a meter on a side, with two large solar panel wings spanning 14 meters extending from opposite sides. The launch mass, including fuel, was 366.5 kg (815 pounds), the mass at the time it reached the Moon was expected to be about 305 kg. Its solar-electric propulsion system (a Stationary Plasma Hall-effect thruster, PPS-1350) used xenon gas as a propellant, ionizing the xenon and accelerating and discharging the plasma from the spacecraft at high speed. Electrons were also released into the flow to maintain a neutral charge on the spacecraft. A thrust of 70 milliNewtons and a specific impulse of 16.1 kN-s/kg (1640 seconds), more than three times the maximum for chemical rockets, was produced. 82 kg of supercritical xenon propellant (60 liters, about 16 gallons) was carried aboard SMART-1 in a tank mounted in the center of the structure above the thruster. The spacecraft was three-axis stabilized using four skewed reaction wheels and eight 1-N hydrazine thrusters mounted on the corners of the spacecraft bus. Attitude knowledge was provided by a star tracker, Sun sensor, and angular rate sensors. 1190 W was available for powering the thruster, giving a nominal thrust of 68 mN, and an acceleration of 0.2 mm/s/s (0.7 m/s per hour, 2/10,000 G). Consequently, orbital maneuvers are not carried out in short bursts, as with chemical rockets, but very gradually, with engine on-time typically once every orbit for about one third to one half of the orbit (when spiralling out, at the perigee side). Over an operating lifetime of 5,000 hours, a delta-v of 4 km/s results, corresponding to a total impulse of 1.5 MN-s.
1850 W of power was produced from an array of gallium-indium-phosphide gallium arsenide germanium (GaInP/GaAs/Ge) solar cells covering an active surface on the wings of about 10 square meters. Solar array power was regulated to 50 V in the power control and distribution unit, distributed via solid-state power controllers, and stored in five 130 W/hr lithium ion battery cells. Roughly 75% of the power was used to run the propulsion system during flight. Thermal control was achieved through the use of radiators, heat pipes, multilayer insulation blankets, thermistor controlled heaters, and high emissivity optical properties. Communication took place via a medium gain and two low gain S-band antennas, as well as the antenna for the experimental Ka/X system. The medium gain antenna provided a telemetry rate of 65 kb/s. The two low gain antennas provided omin-directional ground coverage at 2 kb/s. The medium gain, Ka/X band, and one low gain antenna were mounted on one side panel of the spacecraft bus, and the other low gain antenna was mounted on the opposite panel. The spacecraft carried a suite of science and technology instruments with a total mass of 19 kg. The science instruments included a pan-chromatic camera (AMIE) for Lunar imaging, Langmuir probes mounted on booms (SPEDE) to measure the plasma environment, and radio science experiments (RSIS). Science instruments being tested as part of the technology verification were a miniaturized visible/near-infrared spectrometer (SIR) for Lunar crustal studies, a miniature X-ray spectrometer for astronomy and Lunar chemistry (D-CIXS), and an X-ray spectrometer to calibrate D-CIXS and to study the Sun (XSM). The Electric Propulsion Diagnostic package (EPDP) was a multi-sensor suite designed specifically to monitor the ion propulsion system; it also worked in concert with the SPEDE to study the space plasma environment. The RSIS was also used to monitor the ion propulsion system. An experimental telecommunication and tracking system, the Ka/X-band TTC (Telemetry and Telecommand) Experiment (KaTE) was included in the payload for technology assessment. The AMIE camera was also to be used to support a test of an image-based On-Board Autonomous Navigation (OBAN) system. OBAN was designed to minimize the amount of ground intervention required for the mission. The SMART-1 spacecraft was launched on 27 September 2003 from Kourou, French Guiana, as an auxiliary passenger on an Ariane 5 Cyclade, which launched two other large satellites (India's Insat 3E and Eutelsat E-bird) as its primary payload. SMART-1 was put into a geostationary transfer orbit, 742 x 36,016 km, inclined 7 degrees with respect to the equator. The spacecraft used its ion drive over a period of 14 months to elongate its Earth orbit, utilizing three Lunar resonance maneuvers in August, September, and October 2004 to minimize propellant use. Its final continuous thrust maneuver took place over 100 hours from 10 to 14 October 2004. Lunar orbit capture occurred on 13 November 2004 at a distance of 60,000 km from the Lunar surface. The ion engine began firing in orbit at 05:24 UT (12:24 AM EST) on 15 November to start a 4.5 day period of thrust to lower the orbit. The first perilune took place on 15 November at 17:48 UTC (12:48 PM EST) at an altitude of about 5000 km above the Lunar surface. The engine was then used to lower the initial 4962 x 51477 km altitude, 5 day, 9 hour period, 81 degree inclination orbit, putting SMART-1 into a 300 x 3000 km polar orbit. Lunar commissioning began in mid-January 2005, and Lunar science operations in February 2005. The mission was extended from its originally planned six month lifetime by a year. As a result, SMART-1 was able to conduct mapping of the Moon's surface and evaluating the new technologies onboard from Lunar orbit until it impacted the Moon's surface on 3 September 2006.